A run of labels at the Xeikon stand. Of the many things said about labels and packaging at drupa 2016, some of the most sensible and realistic were the observations made by Ralf Sammeck during KBA’s press conference on day two (May 31) of the 11-day event. Choosing the right platform for packaging is no longer about making crude distinctions between offset and digital, said Sammeck, who is CEO of KBA’s sheetfed solutions business. Far more urgent than trying to decide which process is cheaper is combining both in a model that recognizes the implications of the Internet of Things and Industry 4.0 for the business of printing. Printers who understand this, said Sammeck, focus on managing short runs, selling added value, and helping their customers adapt to fast-changing (even last-minute) market demands. drupa 2016 was a showcase of solutions for achieving exactly the kinds of production capability that Sammeck recommended. This two-part overview of the principal announcements in labels and packaging at the show continues (in alphabetical order) with a summary of what his company brought to the Messe Düsseldorf fairgrounds. Koenig & Bauer Group (KBA) already has deep roots in packaging, but the company wants to plant them even deeper. At drupa, KBA president Claus Bolza-Schünemann noted that 70% of the company’s turnover comes from packaging-related equipment and that 60% of its Rapida sheetfed offset presses are bought by folding carton printers. That still leaves room to grow in the packaging space, and much of what KBA showed at its 3,000-sq.-m. stand in Hall 16 was focused on products the company will bring to market to achieve the growth it is targeting in folding carton, flexible packaging, and corrugated printing. KBA addresses the segments with offset, flexographic, and digital printing equipment, the latter category in partnership with leading providers of inkjet systems. 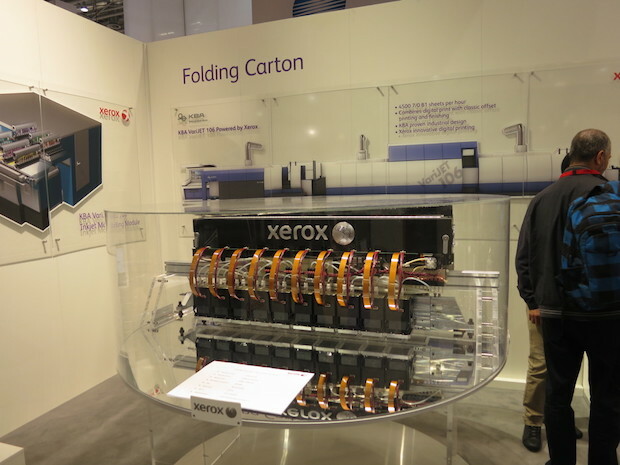 KBA’s newest partner, Xerox, joined it in announcing the KBA VariJet 106, a packaging press displayed in concept at drupa and slated for commercial delivery next year. Aimed at short-run folding carton production, the VariJet 106 surrounds Impika inkjet technology from Xerox with sheetfed press components built by KBA. Available specs show it to be a seven-color device that can print 4,500 B1 (29.5" x 41.7") sheets per hour. The design is modular, enabling the VariJet 106 to be hybridized with inline units for offset and opaque white inks, cold foiling, coating, screen printing, rotary diecutting, creasing, and perforating. The VariJet 106 is KBA’s third joint venture into inkjet for packaging. The company currently is working with HP toward the commercial launch of the HP PageWide Press T1100S, a 110" wide inkjet web press for printing corrugated top liner. The VL series of its RotaJet inkjet web platform, co-developed with R.R. Donnelley, can be used for packaging and other industrial print applications in widths up to 2.25 meters (88.5"). Two of the four Rapida sheetfeds at the KBA stand were set up for labels and packaging: a five-color, B2 (20.8" x 29.5") Rapida 75 and a six-color, B0 (41.7" x 57.0") Rapida 145. According to KBA, the Rapida 145, featuring double-pile delivery and other assets for high-speed packaging production, was the largest and fastest press at the show. The Rapida platform also is the basis of a new rotary diecutter for labels and packaging, the Rapida RDC 106, presented for the first time at drupa 2016. KBA showcased its credentials in flexography with the NEO XD LR, a web press from its KBA-Flexotecnica division for printing flexible film and other packaging substrates. KBA bills this machine as the first fully hybrid flexo press capable of printing with solvent or water-based inks and curing via UV-LED or EB. It can print in up to 12 colors on webs as wide as 64.9" at a maximum printing speed of up to 1,640 fpm. KBA also announced its “return” to the sheetfed corrugated market with the news that it is planning to develop an updated model of its Corrugraph flexo press, first introduced about 10 years ago. The new Corrugraph will have an integrated rotary diecutter, a 59.8" x 133.8" maximum sheet format, and a top speed of 12,000 sph. Among the questions asked most frequently in press conference sessions at drupa were those attempting to tease out who might want to buy Kodak’s Prosper enterprise inkjet business. The company put up it for sale in March, and speculation among journalists and analysts has been intense. However, the uncertainty of Prosper’s fate apparently hasn’t blunted printers’ interest in acquiring the systems: Kodak reported at least six Prosper sales as having taken place during the show. Prosper is well established as a packaging solution. Last year, some 70% of Prosper printhead sales were for packaging applications, and not just in equipment sold by Kodak. Bobst, for example, uses Prosper heads in a sheetfed corrugated press and reportedly is beta-testing them in a web press for folding cartons and flexible packaging. The heart of Prosper is Kodak’s Stream inkjet technology, and the latest generation of Stream is Ultrastream: a continuous inkjet (CIJ) system said to be capable of printing 600 dpi x 1,800 dpi at speeds up to 500 fpm. At drupa, Kodak debuted Ultrastream in an 8" configuration on a narrow-web press for labeling. Ultrastream can be scaled up to 97" wide for packaging and other applications. Kodak remains committed to packaging prepress with its Flexcel family of solutions for flexographic plate imaging. The newly launched Flexcel NX System ’16 has what Kodak describes as advanced plate surface patterning capabilities: NX tags, which permits multiple patterns in a plate layout; and Advanced Edge Definition, for controlling ink flow at the edges of objects. Both features are said to make for more efficient inking and cleaner printing on wide-web flexibles, narrow-web labels, and paperboard. Also aimed at packaging printers was a demonstration of Kodak’s Extended Gamut + Varnish (XGV) technology, in which CMYK plus orange, green, violet, and a water-based varnish were laid down on narrow webs of flexible film. The demo used environmentally friendly, regulation-compliant aqueous inks to show XGV’s suitability for food packaging. On the software side, Kodak announced packaging workflow upgrades for screening, preflight, color management, and waste reduction. The definition of “industrial printing” can be hard to pin down, but as far as Konica Minolta is concerned, it includes packaging and labels—application areas where the company means to be a leading player. It will try to do this both with its own products and with systems developed by MGI, a digital printing and finishing equipment company in which Konica Minolta now holds a 40.5% ownership stake. Accordingly, Konica Minolta dedicated portions of its 2,400-sq.-m. stand in Hall 8B to the printing of personalized packaging and labels. There, visitors could see a bizhub PRESS C1100 printing packaging blanks that were then cut, folded, and glued inline; and a bizhub PRESS C71cf label press similarly integrated with an MGI system for spot UV coating and embossed hot foiling and a converting / finishing unit from Grafisk Maskinfabrik (GM). Konica Minolta broke into inkjet production at drupa 2012 with a prototype of the KM-1, a B2 (20.8" x 29.5") cut-sheet press it co-developed with Komori. Today its inkjet line goes by the brand name Accurio, and the two presses currently in it are applicable to packaging. Launched at drupa was the B2+ (23" x 29.5) AccurioJet KM-1, offering 1,200 x 1,200 dpi printing with UV ink on packaging and other stocks at up to 3,000 sph (simplex). Shown in technical preview was the Accurio KM-C, a flatbed B1 (29.9" x 41.7") press for folding carton and thin corrugated applications. Developed entirely by Konica Minolta, the Accurio KM-C was said to be capable of processing cardboard and microflute at up to 2,200 sph. 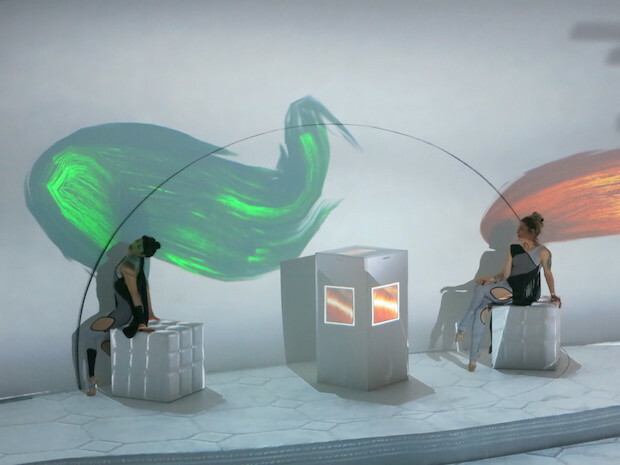 A scene from Landa’s special-effects-laden stage show. Quad/Graphics and Imagine! in the U.S. Cimpress, colordruck Baiersbronn, and Elanders in Europe. These are some of the customer names associated with what Landa Digital Printing says is the €455 million (about $511 million) worth of orders it took for its Nanographic printing presses at drupa 2016. This included multiple requests from all major geographic regions, according to Landa, which drummed up the business with elaborate stage shows and nonstop sales meetings from the beginning of the event to its close. The details of what Nanography is and how Landa has built two generations of digital printing systems around it have been extensively reported by the trade media. Claiming the devices to have the lowest cost per page of all printing methods, the company is positioning them as competitive with offset lithography in the run lengths where the majority of offset printing takes place. The presses seen at drupa 2016 are refinements of devices that Landa unveiled at drupa 2012 but did not to bring to market in their original form. Two of the current crop are for packaging printing. The Landa S10 Nanographic Printing Press is a simplex B1 (29.5" x 41.3") sheetfed press that can print containerboard and other media up to 32 pt. at a top speed of 13,000 sph. Flexible packaging is the target application for the Landa W10 Nanographic Printing Press, built to print one side of a 41.3" web in four to eight colors at up to 200 m/min (656 fpm). These presses are scheduled to beta-test and ship next year, as are their duplex-printing counterparts for applications other than packaging: the Landa 10SP and the dual-engine Landa W10P (the latter announced at drupa). Landa also demonstrated Nano-Metallography, a process said to add metallic highlights without waste and at half the cost of conventional foiling. 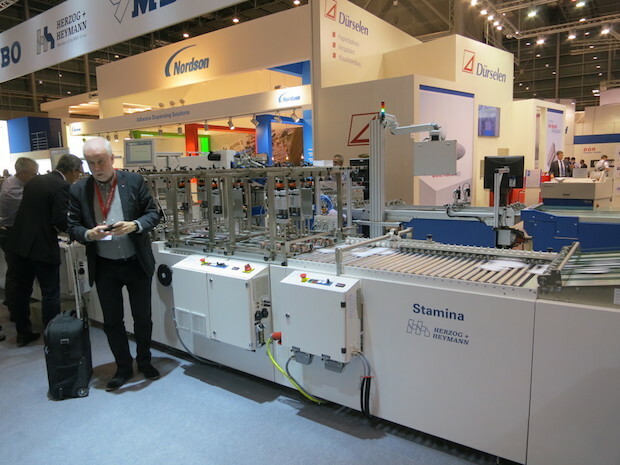 MBO’s Stamina all-in-one production line for folding carton finishing. Nomenclature can be a bit of a challenge for MBO because its products so often work as linked components of finishing lines that have been configured for specific purposes. This means that the line gets a functional description, but not necessarily a product name—what the system does takes precedence over what the line and its individual units are called. MBO showed 12 such lines in operation at drupa, and the one dedicated to folding carton finishing enjoyed the distinction of having a name of its own: Stamina. This setup, combining boxmaking processes with an integrated rotary diecutter, signaled MBO’s determination to expand its footprint in folding carton production. It also stood for an engineering strategy that emphasizes mix-and-match modularity and one-pass operation with as few human touches as possible. 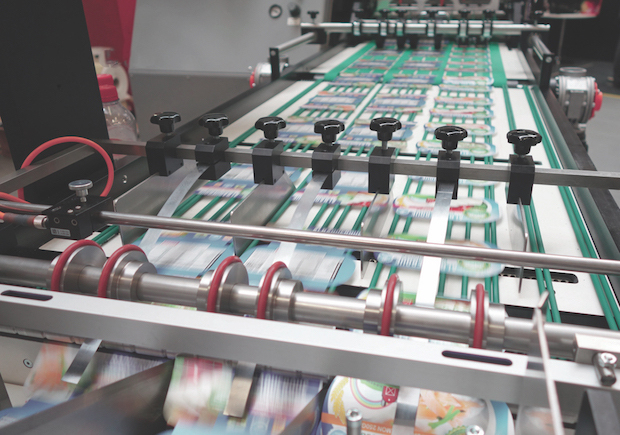 Manufactured by MBO subsidiary Herzog+Heymann, Stamina is a customizable chain of machines for producing pharmaceutical boxes and other types of folding cartons from preprinted rolls or sheets. Functions include diecutting, stripping and matrix removal, registering, folding, and hot or cold gluing—all in one sequence. An integrated camera system enables the line to match preprinted inserts (such as pharmaceutical leaflets) to the boxes they belong with. A Scodix digital enhancement press (upper left) and some of the things it can do. Calling the process “digital enhancement,” Scodix makes a line of specialty presses that add tactile and metallic effects to luxe packaging forms and other preprinted items. The company introduced its first such press at drupa 2012 and has placed 200 of its machines around the world since then. 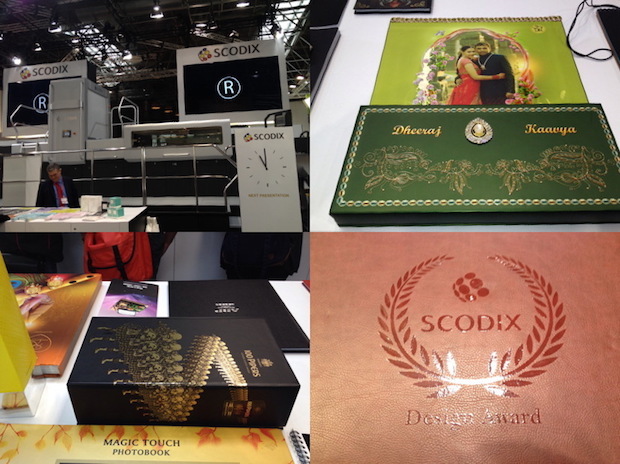 Scodix reported taking orders for more of them at drupa 2016, where it expanded the press line to five models with the introduction of a B1-format device. All of these digital platforms, says Scodix, let printers and converters put value-adding fancy touches on medium and short runs without the high tooling and setup costs that come with analog finishing equipment. Combining multiple effects in one device running at high speed increases versatility and cost effectiveness, according to the manufacturer. The most multi-capable Scodix press is the newly launched E 106, which has a 41.7" x 29.9" format and a top speed of 4,000 sph. With its inkjet heads, an inline foiling unit, and a paper handling system from Mabeg GmbH, the E 106 offers the full range of Scodix premium effects (including Braille and variable finishing) in one device. As one of the pioneering developers of variable-data digital printing in color, Xeikon has undergone a series of ownership changes that culminated in its acquisition about six months ago by the Flint Group, a top-tier supplier of inks, coatings, pressroom chemistry, and other consumables. As the division called Flint Group Digital Printing Solutions, Xeikon will continue to develop and sell its products under the legacy brand name. The new toner, named Tonnik, is an outgrowth of Trillium, a liquid-toner technology first announced by Xeikon at drupa 2012. Tonnik was incorporated in a web press introduced at drupa 2016—the 19.7", 200 fpm Trillium One, jointly developed with Miyakoshi. Xeikon says that by combining the best properties of dry and liquid toners, Tonnik will become the most sustainable, environmentally friendly, and economical colorant for digital printing, including labels and folding cartons. The fast label press formerly known as Cheetah is now the Xeikon CX3, seen at drupa printing labels in five colors at 98 fpm. Folding-carton printing was the principal use to which the dry-toner Xeikon 3500 was put, with its variable (9.8" to 20.3") web width, 63 fpm top speed, and integrated units for UV coating, aqueous varnishing, and stacking. The postpress device, the Xeikon FDU, is a 2,000-sph flatbed diecutter that can process paper, carton board, and microflute corrugated board in sheets up to 20.9" x 39.4". For now, Xeikon Fusion Technology for label and packaging production remains in the concept stage. As it was explained at drupa, Fusion is being developed as a series of modules that will be fully integrated with a dry-toner, five-color Xeikon press—and with each other—for complete one-pass printing and embellishment. Special effects potentially include hot and cold foiling, screen-printed opaque white, tactile varnishes, spot printing, and Braille. All of this is to be controlled by a Xeikon digital front end that sets up the modules for their tasks without the need for operator intervention. A look at what Xerox has contributed to KBA’s VariJet 106 packaging press. The headline news in packaging from Xerox was about the part it played in the development of the KBA VariJet 106, which is to be unveiled by KBA at an open house in Germany toward the end of the year. Available at drupa were a few details about the Xerox Impika inkjet heads in its engine. Spanning a printing width of 42.3", their 64,000 nozzles emit 2.5-picoliter drops of water-based ink at a resolution of 1,400 x 1,400 dpi. The piezoelectric drop-on-demand heads are capable of full variable-data printing. Other developments applicable to packaging and labels included two refinements for the Xerox iGen 5 Press: a clear toner for its fifth station and FDA-compliant blue, green, and orange expanded-gamut colorants (also dispensable from the fifth station). Xerox says that its new Direct to Object Inkjet Printer can substitute for retail labels by printing product information directly onto the surfaces of three-dimensional objects up to the sizes of football helmets and shoes. Also presented at the Xerox stand was an inkjet press for UV printing on plastic packaging substrates. This device, an adaption of a Xerox CiPress roll-fed inkjet press, features a 20" printing width and a CMYK configuration plus UV coating and a fifth color. The resolution is 600 x 600 dpi, and the claimed printing speed is 100 fpm. The machine’s special application is thermoformed packaging, which it is able to print directly with flexible and stretchable inks that stand up to heat. When films printed with them are formed into blister packs, the ink does not crack or distort. Xerox says that direct printing to film can do away with the need for stickers on or cardboard inserts in thermoformed packages. Pouches, bags, and shrink films are other candidates for production on this press.